CSC has certified 160-plus plants in eight countries, and was developed in 2017 with input from the Portland Cement Association and the World Business Council for Sustainable Development’s Cement Sustainability Initiative, whose activities more recently transitioned to GCCA. “The CSC has established a highly-respected and internationally applicable responsible sourcing scheme for concrete and its main constituents of cement and aggregates,” says GCCA Concrete and Sustainable Construction Director Dr. Andrew Minson. 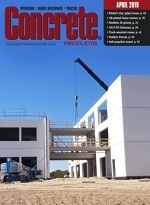 Project principals can be assured of socially and environmentally responsible practices through the concrete supply chain when specifying CSC-certified concrete, GCCA affirms. Internationally recognized sustainable project assessment methods such as BREEAM and DGNB, moreover, credit design teams and their projects with points when such material is specified and procured.